Central venous catheterization is a simple, relatively inexpensive method of assessing a patient's circulating blood volume, cardiac status, and vasomotor tone and is an essential component of modern-day critical care. Although it is relatively safe, numerous complications are described both during placement and in the maintenance of the catheter. Malposition of the catheter tip is one of them. Usually errors involve misdirection of catheters within major tributaries of the superior vena cava. However, the possibility of entering smaller tributaries of the central veins is often forgotten and only rarely reported. There is only one incidence of misdirected catheter in the smaller tributary of 2104 central venous catheterizations according to Muhm et al. This report of two cases illustrates a rare malposition of a central venous catheter tip in a small tributary of left brachiocephalic vein. A 38-year-old female was admitted to our critical care unit with a diagnosis of leptospirosis and complicated malaria. She was in respiratory distress. The possibility of fluid overload was considered, and it was decided to place a central venous catheter for monitoring of central venous pressure after intubation. A 7-French triple lumen central venous catheter was placed through the left internal jugular vein (IJV) due to failed right IJV cannulation with all aseptic precautions by using the Seldinger technique. The catheter was fixed at the 13-cm mark at the skin level after free aspiration of venous blood. After flushing the catheter with heparinized saline, opening central venous pressure (CVP) was noted as 3 mmHg. On connecting the transducer to the monitor, it was observed that a characteristic waveform was absent. The central venous waveform could not be obtained despite the change of the transducer, the cable, flushing the unit, and repeated zeroing. 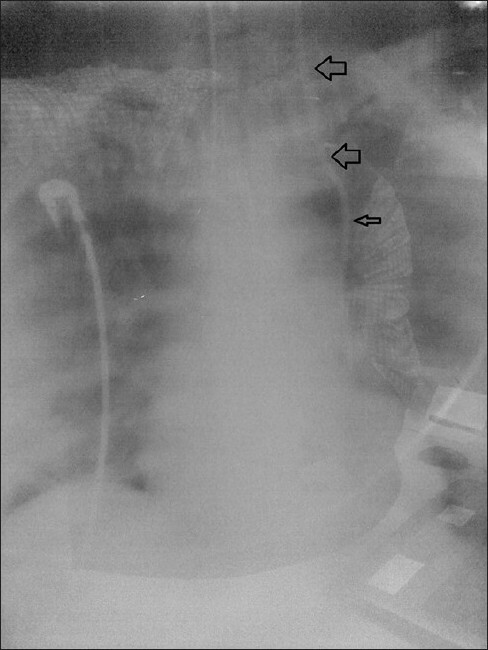 An anteroposterior chest radiograph, obtained to confirm the position of the catheter, revealed the left paramedian location of the catheter following the aortic knuckle and pointing medially [Figure 1]. Lateral chest film was inconclusive. The catheter was removed, as it was considered to be in one of the small tributaries of left brachiocephalic vein and an alternate venous access was obtained subsequently via the right subclavian vein. A 45-year-old male patient was brought to the emergency room with unconsciousness and hemodynamic instability with a background history of distal renal tubular acidosis. In view of the clinical condition of the patient and the need to know intravascular volume status, a 7-French triple lumen central venous catheter was inserted in the left IJV due to failed right IJV cannulation in the emergency room by using the Seldinger technique. All the three ports were checked for free flow of blood and the catheter was fixed at the 13-cm mark at the skin level. Opening CVP was 5 cm , but the central venous waveform could not be obtained despite the change of the transducer, the cable, flushing the unit, and repeated zeroing. There was also an unusual tachycardia during infusion or flushing through the central port. An anteroposterior chest radiograph, obtained subsequently to confirm the position of the catheter, revealed the left paramedian location of the catheter following the aortic knuckle and pointing laterally [Figure 2]. 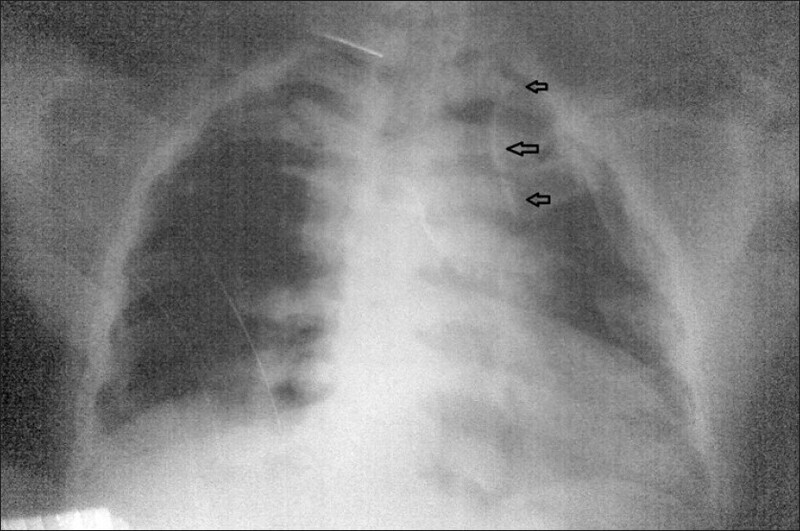 Lateral chest film could not be obtained. The catheter was removed and an alternate venous access was obtained subsequently via the right subclavian vein. The correct placement of the central venous catheter tip is an important factor in obtaining accurate CVP measurements. Inaccurate CVP measurements or inability to obtain an ideal wave from tracing are suggestive of an undesirable location of the catheter tip. Unusual tachycardia during infusion or flushing through central port may also suggest "thoracic pain syndromes" described by Webb et al. Due to inexperience, the tachycardia was appreciated only retrospectively. Occasionally, however, despite proper technique, the tip of the catheter may not terminate at the desired level. Malposition of the catheter tip may occur at the time of insertion or later as a result of spontaneous migration due to anatomic positioning or pressure changes within the thoracic cavity. Because of the longer course and more transverse lie of the left brachiocephalic and more frequent smaller tributaries, malposition of the venous catheter is commoner when cannulation attempt is made via the left brachiocephalic vein rather than its right-sided counterpart. In this report both the cannulations were done through left internal jugular vein because there is failed right IJV cannulation. On lateral chest films, the internal mammary vein will lie in the anterior mediastinum and the pericardiophrenic vein in the middle mediastinum, while the superior intercostal vein will occupy the posterior mediastinal position. The most common locations for the malposition of venous catheters while attempting to cannulate the internal jugular vein include the internal mammary vein and the pericardiophrenic vein. On posterior--anterior or anterior--posterior views, the internal mammary vein will be located more laterally, catheter in the superior intercostal vein will follow the aortic knob, and pericardiophrenic vein catheter will follow the left cardiac border. So in our Case 1, the catheter tip may be in pericardiophrenic vein, and in Case 2 the small tributary may be the superior intercostal vein. A lateral film would have been helpful in distinguishing these possibilities but was inconclusive in Case 1 and could not be done in the second case as the patient was unstable. A venogram could have established the exact location of the catheter beyond any doubt. But both the patients were renally compromised, and so the use of dye was contraindicated. So the take-home message is that when the central venous waveform could not be obtained despite the change of the transducer, the cable, flushing the unit, and repeated zeroing, a strong suspicion of misplacement of central venous catheter tip into a smaller tributary to be kept in mind. The ability to aspirate blood freely from the catheter lumen after the placement of the catheter does not necessarily confirm a proper placement of the catheter tip. The use of chest radiographs to establish the correct placement of central neck lines is to be routinely practiced. It would be a good practice to have a lateral view to confirm the central neck line placement when the anteroposterior view is not reassuring. We recommend a computed tomography scan of the thorax or venography to assess the position of the catheter in case of radiological dilemma. 1. McGee DC, Goud MK. Preventing complications of central venous catheterization. N Engl J Med 2003;348:1123-33. 2. Webb JG, Simmonds SD, Chan-Yan C. Central venous catheter malposition presenting as Chest pain. Chest 1986;89:309-12. 3. Muhm M, Sunder-Plussmann G, Druml W. Malposition of a dialysis catheter in the accessory hemiazygos vein. Anesth Analg 1996;83:883-5. 4. Agrawal P, Gupta B, D'souza N. Coiled central venous catheter in superior vena cava. Indian J Anaesth 2010;54:351-2. 5. Asudani D, Wretzel S, Patel R, Stayman A. The Clinical Picture: A judgment call. Cleveland Clin J Med 2008;75:690-5. 6. Rasuli P, Hammond DI, Peterkin IR. Spontaneous intrajugular migration of long term central venous access catheters. Radiology 1992;182:822-4. 7. Tong MK, Siu YP, Ng YY, Kwan TH, Au TC. Misplacement of a right internal jugular vein haemodialysis catheter into the mediastinum. Hong Kong Med J 2004;10:135-8. 8. Sarnak MJ, Levey AS. Placement of an internal jugular dialysis catheter into the superior intercostal vein. Nephrol Dial Transplant 1999;14:2028-9.